Are you looking for a nice campsite in the beautiful nature of Sweden, 30 km from the city of Karlskrona? With us it is quiet, cosy, it is an excellent place for walking, cycling, swimming and canoeing. We have a special kids programm in high- and middle season, please take a look at our activities. You will find us between Karlskrona and Emmaboda and in this area the weather is often better than in other parts of Sweden and …. it is very beautiful here! 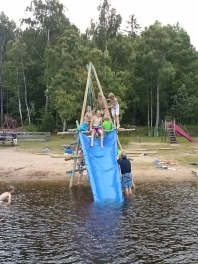 Take a swim in lake Alljungen (only 100 meters away from the campsite), where the water is warm (upptill 27 degrees) and very clean or spend a day´s fishing! Have you been curious? Do not hesitate to send us a message with your question. We usually will answer within 24 hours.